Washington’s first inauguration took place on April 30, 1789 on the balcony of Federal Hall in New York City. Throngs of well wishers lined Queen Street, Great Dock, and Broad Street—now the foot of Wall Street in southern Manhattan—cheering the new president after the oath was administered. But it was Washington’s second inauguration—held in the Senate Chamber of Congress Hall in Philadelphia, Pennsylvania on a date determined by the Continental Congress—that established March 4, 1793 as the official inauguration date. In the future, if March 4th fell on a Sunday, the inauguration was then held on the following Monday, March 5th, out of respect for the Sabbath, and because most public government offices were closed on Sundays. James Monroe, Zachary Taylor, Rutherford B. Hayes, and Woodrow Wilson all delivered their inaugural addresses on March 5th. Presidents need time between the presidential election and their inauguration to organize their cabinet and make plans for their government. 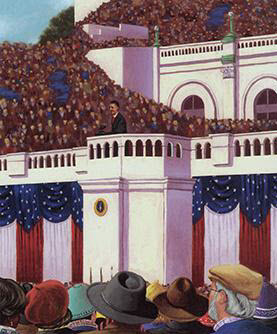 By 1932, Congress realized that the length of time between election day and the March 4th inauguration date was too long, often keeping the incoming president from addressing national problems that needed urgent attention. President Franklin Roosevelt’s first inauguration illustrated that dilemma; an urgent need existed for the incoming president to confront with immediacy the serious challenges facing the nation during the Great Depression. In response to this need, Congress passed and on January 23, 1933 ratified, the Twentieth Amendment of the United States Constitution. Section One of the Twentieth Amendment stipulates that “the terms of the President and the Vice President shall end at noon on the 20th day of January,” meaning the incoming President and Vice President must take their oaths of office as close to noon on January 20th as possible so that the nation has continuous leadership. As established with the previous inaugural date of March 4th, when the January 20th date falls on a Sunday, the inauguration then takes place on Monday, January 21st. Since 1933, three presidents have held their public inaugural ceremonies on January 21st—Dwight Eisenhower, Ronald Reagan, and Barack Obama. OUR WHITE HOUSE. Illustration © 2010 by A. G. Ford. Reproduced by permission of the publisher, Candlewick Press, Somerville, MA. In 2013 January 20th once again fell on a Sunday, and consequently the public inaugural ceremony was held on Monday, January 21st. This one-day delay created a remarkable historical coincidence, for our nation also celebrated Martin Luther King Day that year on January 21st. Our nation’s first African-American president publicly took the oath of office for his second term on the day we honor the service and sacrifice of an African-American national hero, Martin Luther King, Jr. Since the Constitution stipulates January 20th as the official presidential transition date, Supreme Court Chief Justice John Roberts administered the oath of office to President Obama in the White House on Sunday, January 20, 2013 in a private, simple ceremony. The press and the media covered the private ceremony so that the public could “witness” the swearing-in. The public inauguration, parade, and celebratory balls all took place the next day. On January 20, 2009 when Chief Justice Roberts administered the presidential oath to President Obama at his first inauguration in a public ceremony on the west front of the Capitol building, Justice Roberts misspoke the oath. “Out of an abundance of caution,” according to the White House, the Chief Justice then enacted a second oath-taking for the president, privately, in the Map Room of the White House. Although the circumstances are different in his second term, President Obama again took the oath twice in both a public and private ceremony. He has taken the presidential oath a total of four times. The only other president who has taken the oath of office four times is President Franklin D. Roosevelt, who served four terms in office—another remarkable historical coincidence given that both President Obama’s supporters and detractors have compared his Patient Protection and Affordable Care Act, more commonly known as Obamacare, to the achievements of President Franklin Roosevelt’s New Deal accomplishments. Learn more about the Twentieth Amendment on the Exploring Constitutional Law website.